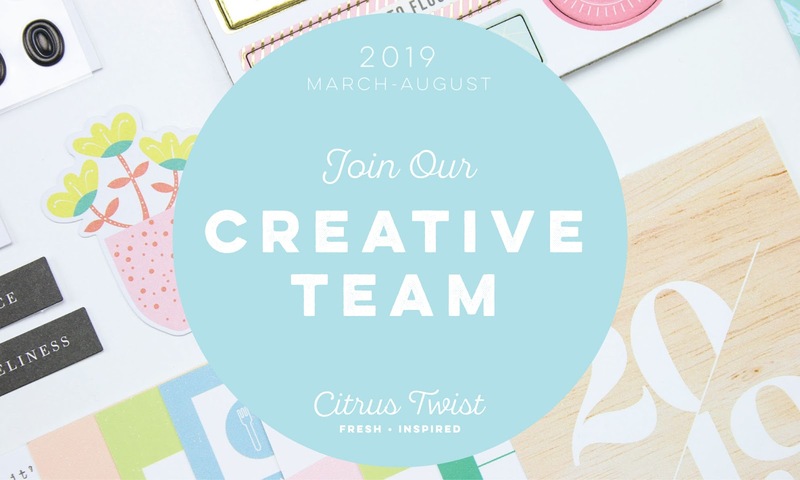 We are so excited about your interest in joining the 2019 Citrus Twist Creative Team. As a member of the 2019 (March-August) Creative Team, you will be expected to create 3-4 projects per month, photograph them and write blog posts to go with your projects. You will also be required to participate at least once during your Creative Team period (March 2019-August 2019) in our Subscriber monthly workshop (video format using the Life Crafted kit). Some of your projects will be posted on the Citrus Twist Blog and occasionally other Citrus Twist social media channels. One paragraph introducing yourself. Tell us when you started scrapbooking and how you would define your personal style. What excites you most about Citrus Twist Life Crafted? Are you on any other design teams? Please include your name and where you are from. Let us know who you are as a crafter and your experience in the industry. 5 Styled Images. Please include 1 Scrapbook Layout, 1 traveler’s notebook spread, 1 PL page or spread, 1 example of an Instagram Story Tutorial, and 1 project of your choice (something that defines who you are as a creative). The deadline to send applications is Friday, January 25, 2019. The new team will be notified via email on February 2, 2019. International applications will be considered. Questions? Email hello@citrustwistkits.com. Good luck!